WIT's Harold Teams Welcome 24 New Players Improviser and ASL Interpreter Erin Murray: "I want to respect the deaf culture by trying to adapt what I’ve learned doing improv"
When you’re running an improv theater—or any other nonprofit for that matter—you try to avoid mistakes. You work to create the best possible experience to advance your mission. At some point though, no matter how many times you get it right, mistakes happen. In improv, one of our key tenets is, “There are no mistakes, only gifts.” And, true to that idea, when WIT recently faced a miscommunication around an Improv for All workshop, treating that mistake as an opportunity turned into an unexpected series of gifts. 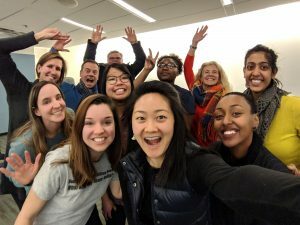 It all began on a cold night in January when WIT hosted an Improv for All workshop at the DC Public Library in Shaw. A scheduling miscommunication left a group of strangers in a room, ready to take the leap into improv, but without a teacher to guide them. Hui Hung takes a selfie of the Shaw Library team. Participants at the Chesterbrook Taiwanese Presbyterian Church workshop. Two other workshop participants took us up on the offer to sign up for a discounted Level One. All participants said they were excited about the free tickets for upcoming shows in March. In addition, WIT offered the chance to schedule private Improv for All workshops. One participant, Hui Hung, said yes to our offer. As a result, Caroline Howe and Melissa Gedney did a workshop for the Chesterbrook Taiwanese Presbyterian Church in Northern Virginia. 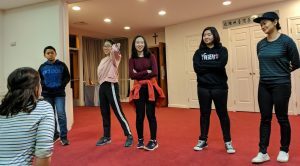 A group of 14 young people and adults at the church got to learn more about improv as the result of the connection. 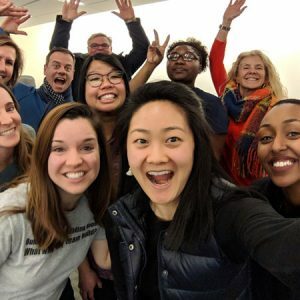 In FY2018, WIT held Improv For All workshops across D.C., sharing improv with 1,000 participants. If you would like to give improv a try, check out the schedule for upcoming free workshops.